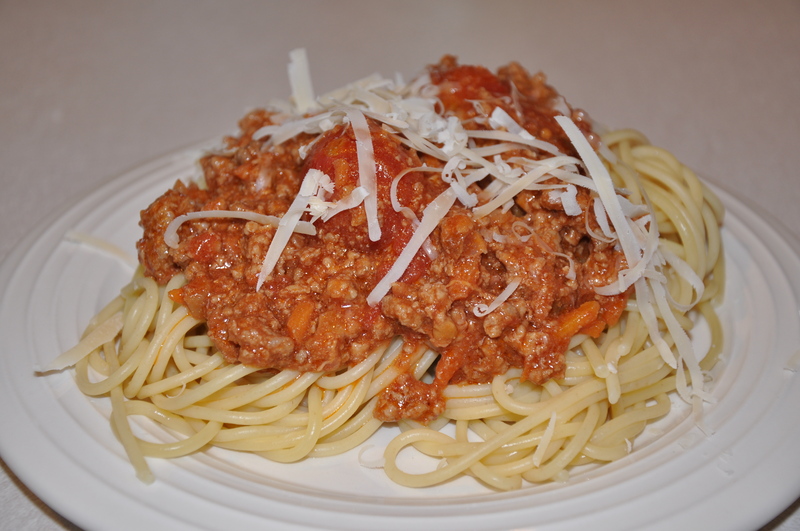 I first made Bolognese Sauce when I saw it being made on the Rachael Ray show a couple of years ago. Wikipedia, the knower of all things describes “Bolognese sauce (ragù alla bolognese in Italian, also known by its French name sauce bolognaise) is a meat-based sauce for pasta originating in Bologna, Italy. Bolognese sauce is sometimes taken to be a tomato sauce, but authentic recipes have only a small amount of tomato concentrate.” This is a sauce that is full of flavor and often takes about 3 hours to make. 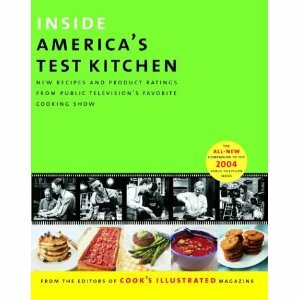 I blogged earlier about America’s Test Kitchens and how in-depth they go with their cookbooks. They take every recipe apart and go from it with almost a scientist precision of observation and notation. Nothing is left when they are done with a recipe. Once again, they also give the breakdown on kitchen gadgets and supplies as well. The one thing that you will get with this cookbook, is details….lots and lots of details. If you are wondering if you should pick up a spoon, these recipes go into extreme details. For someone like me who is an ADD cook, I tend to skip over parts and need to go back and try to focus better. The Ruling: Well I have been making the Rachael Ray one for a couple of years now….so I am really biased towards that one. This Bolognese was just ok to me, nothing special. I think the part that I was missing was the red wine and the flavor that it give to the Rachael Ray sauce. If you have never made Bolognese before, you will probably enjoy it. The part that kind of was weird to me was to cook the meat in milk. This is a technique that they discuss in the cookbook to keep the meat more tender. It was just a little too weird for me. I am not a raw meat person to begin with and I have never been a lover of milk, so the two together, was just a little weird to me. The taste test was that the family ate it….besides the youngest as he does not like meat that is ground up….remember….he is an odd duck! Cover the porcini mushrooms with 1/2 cups water in a small microwave-safe bowl; cover the bowl with plastic wrap, cut a few steam vents with a paring knife, and microwave on high power for 30 seconds. Let stand until the mushrooms have softened, about 5 minutes. Using a fork, lift the porcini from the liquid and transfer to a second small bowl; pour the soaking liquid through a paper towel-lined mesh strainer. Set the porcini and the strained liquid aside. Bring the wine to simmer in a 10 inch nonstick skillet over medium heat; reduce the heat to low and simmer until the wine is reduced to 2 tablespoons, about 20 minutes. Set the reduced wine aside. Meanwhile, pulse the carrot in a food processor until broken down into rough 1/4 inch pieces about then 1-second pulses. Add the onion: pulse until the vegetables are broken down into 1/8 inch pieces, about ten 1-second pulses. Transfer the vegetables to a small bowl. Process the softened porcini until well ground, about 15 seconds, scrapping down the bowl if necessary. Transfer the porcini to the bowl with the carrot and onion. Process the pancetta until the pieces are no larger than 1/4 inch, 30 to 35 seconds, scraping down the bowl if necessary; transfer to a small bowl. Pulse the tomatoes with juice until chopped fine, six to eight 1-second pulses. Heat the butter in a 12-inch skillet over medium-high heat; when the foaming subsides add the pancetta and cook, stirring frequently, until well browned, about 2 minutes. Add the carrot, onion, and porcini; cook, stirring frequently, until the vegetables are softened but not browned, about 4 minutes. Add the garlic and sugar; cook until fragrant, about 30 seconds. Add the ground meats, breaking the meat into 1-inch pieces with a wooden spoon, about 1 minute. Add the milk and stir to break the meat into 1/2 inch bits; bring to a simmer, reduce the heat to medium, and continue to simmer, stirring to break up the meat into small pieces, until most of the liquid has evaporated and the meat begins to sizzle, 18 to 20 minutes. Stir in the tomato paste and cook until combined, about 1 minute. Add the tomatoes, reserved porcini soaking liquid, 1/4 teaspoon salt, and porcini liquid, 1/4 teaspoons salt, and pepper; bring to a simmer over medium-high heat, then reduce the heat to medium and simmer until the liquid is reduce and the sauce is thickened but still moist, 12 to 15 minutes. Stir in the reduced and the sauce is thickened but still moist, 12 to 15 minutes. Stir in the reduced wine and simmer to blend the flavors, about 5 minutes. Meanwhile, bring 4 quarts water to a rolling boil, covered in a stockpot. Add 1 tablespoons salt and the pasta, stir to separate, and cook until al dente. Drain, reserving 1/4 cup pasta cooking water, and return the pasta tot he stockpot. Add 2 cups sauce and 2 tablespoons pasta water to the pasta; toss well, adding the remaining pasta water, if necessary, to help distribute the sauce. Divide the pasta among individual bowls and top each portion with about 1/4 cup remaining sauce. Serve immediately, passing the Parmesan separately. MS. Simplicity, also known as Melissa Schmalenberger operates her business as I Did it with MS. Simplicity. She is a Professional Organizer based out of Fargo, ND and her website can be found at www.ididit-fargo.com . Need to contact MS. Simplicity privately, you can email her at melissa@ididit-fargo.com. For daily organizing tips find the MS. Simplicity fan page here. If you try any of my suggestions, I would love to hear from you. It helps me to understand what my readers want me to write about and what they think is a waste of their time….thanks for taking the time to help me out.